Last month I presented a preview of Logic Pro 7, and having used it now for a few weeks, I feel able to delve a little deeper into some of its mysteries. I don't want to go over old ground again, so if you're looking for the complete picture, it would be best to start by reading that preview. The first change most users will encounter is the subtle but noticeable Apple restyling of the user interface and its menus. Most of the menus are clearer for the redesign, though everyone I've asked so far finds the overall look of the program a little more drab than they're used to, especially in the Audio Environment window, where the channel strips and background are almost the same shade of grey. In fact some users (including some SOS Forum visitors) have commented that the interface now looks too dark and is more 'Windows-ish', which must be that last thing Apple want to hear! Personally, I'd have liked a bit more of the Fresh Aqua influence and a bit less Teutonic gloom. Furthermore, the text size in the Arrange window parameter boxes is very small and can't be changed, so although there are some strategical improvements to make operation less ambiguous, on my 20-inch Apple monitor at optimal resolution the text can be difficult to read. On the plus side, the parameter boxes are now resizable in the horizontal plane and the channel strip fader no longer falls off the bottom of the screen if you have less than a 23-inch monitor or if you shrink the vertical height of the Arrange window. The new Global Tracks view collects together tracks that affect the entire song, such as the Marker and Chord tracks. Parameters that have plus and minus values now have plus and minus signs to go with them and so on, but one change I really don't like is that the panel of track icons has been replaced by a pull-down list only one icon wide and what seems like about three metres long, which makes selecting a new track icon extremely tedious. Some way to remove icons you don't intend to use from the list would be useful; there's no way to do that in this version, but Apple are aware of the criticism and so may well change things in a future revision. They've added a few more pictorial icons, which I really like, but have also restyled the remaining MIDI instrument icons to the extent that it's very difficult to tell some of them apart. It would be a nice gesture if Apple were to set up a part of the Logic community web site for users to create and exchange icons. Option-clicking on the icon in the Instrument Parameter Box allows you to directly input the number of the icon you wish to assign to that instrument, so if you know the icon number you want, this could speed things up a bit. Another improvement is that when you open a Logic software instrument, its icon now loads directly into the track. Another new feature in the interface that is immediately obvious is that helpful little parameter/info boxes pop up when you are editing to tell you things like the length and position of the item you're working on. Mostly these are helpful, but you can switch off this feature in preferences if it annoys you. There's also a new Global Tracks display, which collects together various types of track that affect your entire project. It's available from within the Arrange, Matrix, Hyper Edit and Score Edit windows, and offers graphical control over tempo, key, time signatures and markers, as well as providing a place to display imported imported video thumbnails. The Global Tracks display is normally at the top of the relevant window's working area and can be hidden when not required. Markers, with which many Logic users are already familiar, now have their own track wherein the length, colour and text content of markers can be edited. The main advantage of having a Marker track is that from here markers can be copied, moved or changed in length by dragging. When a song is playing, clicking in the Marker track while holding down Option causes the song position cursor to jump to the beginning of the selected marker. The new Track Mixer: more grey than before, but there are new features too! 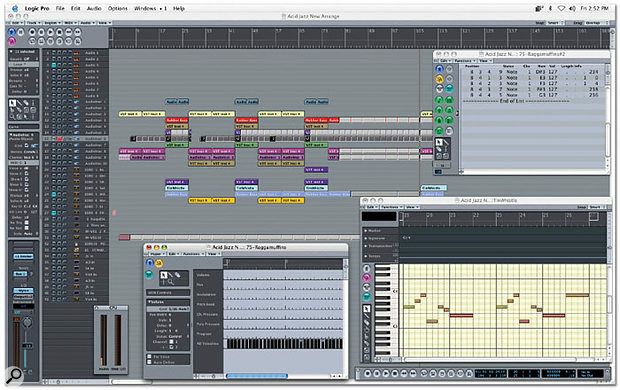 Beat Mapping replaces the old Reclock function and also has its own track. This function allows the bar position to be realigned to any audio or MIDI event so that the tempo of the song can be made to conform to that of a MIDI or audio part that was played in independently of the metronome or imported from another source. In practical terms, this feature is similar to an improved version of Reclock and means you can still tap in a tempo track manually, using a MIDI sound source, then edit the beat positions to get them to exactly match the audio track before creating a matching tempo track. This doesn't change the way the parts play back, but the bars and beats display can be made to correspond to the audio, which in turn makes editing easier. The Signature track shows the musical key signatures of the song and the time signature based on what is shown in the Score Edit page, whilst the Chord Track is a new addition and is able to derive chord symbols from MIDI regions using an intelligent algorithm. You can also enter chords manually. The chords thus derived can be used to control the transposition of MIDI and Apple Loops parts to some extent, based on the root note of the extracted chord. 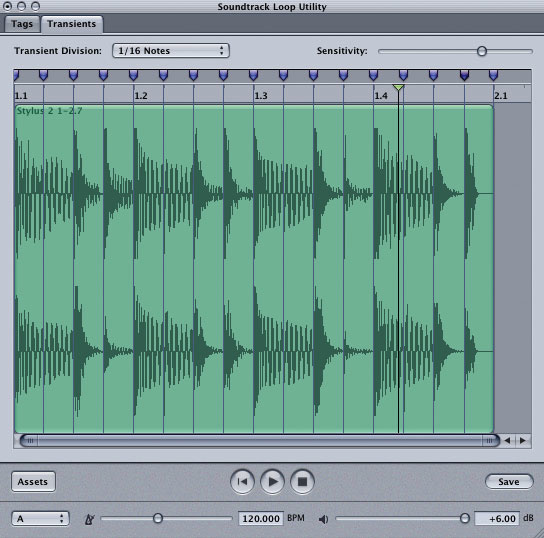 By contrast, the Transpose track is simply a graphical means of adding a musical pitch-shift (in semitones) to any MIDI or Apple Loops parts in the song, though it can't affect conventionally recorded audio parts — these must be converted to Apple Loops first if you want to use this facility, though you'd be more likely to use it to create a song structure from MIDI and Apple Loops, before recording the appropriate audio parts. If the Chord track is being used, the chord root notes will be linked to the transposition value set in the Transpose track. In other words, chords in the Chord track can affect global transposition and will affect Apple Loops and MIDI regions, with the amount of transposition being based on the difference between the root note of the song's key signature and the root note of the chord. However, in songs where this might cause confusion, the Chord track can be switched to a view-only mode that prevents it affecting MIDI data (though not Apple Loops) and this is also entered automatically when MIDI regions are being analysed. As far as I can see, the main use of this feature is in automatically transposing Apple Loops so that they match the chord progression of the song. Lastly, there's now a dedicated Video track that shows thumbnail frames of a Quicktime movie in sync with the music. Scene changes are automatically detected and marked. Because the Global Tracks view shows a lot of information, there are key commands for hiding and showing the various component tracks and in the top left corner of each Global track for expanding or shrinking the track view. As with 'normal' tracks, the individual Global tracks can be locked to prevent accidental changes. 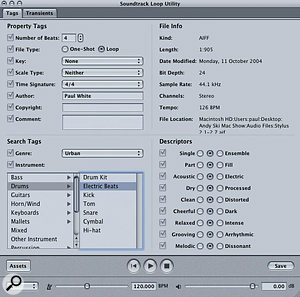 The Apple Loops Utility identifies transients in an audio loop and stores that information as metadata. The Tags page allows you to enter descriptive data about your loop material. One big feature mentioned last month was the ability of Logic Pro 7 to open Garage Band songs and to import Apple Loops directly. Apple Loops are the special type of audio file used by Soundtrack and Garage Band as well as Logic Pro 7, and contain metadata along with the audio, enabling them to be pitch-shifted or time-stretched over a wide range with minimal side-effects. The metadata also includes 'tag' information describing the loops' genre, instrumentation and so on, allowing you to search for loops that meet particular criteria. An Apple Loops Utility comes as part of the Pro 7 package so users can edit their own audio files and categorise them according to tempo, style, mood and so on. This can be invoked directly from Logic 's Arrange page by selecting an audio region, then choosing Audio / Open in the Apple Loops Utility. This little sub-program is based around two windows, or panes as Apple prefer to call them. The Tags pane is where all the descriptive data relating to the audio is entered, including details that help you find the file when you are searching in the Loop Browser. 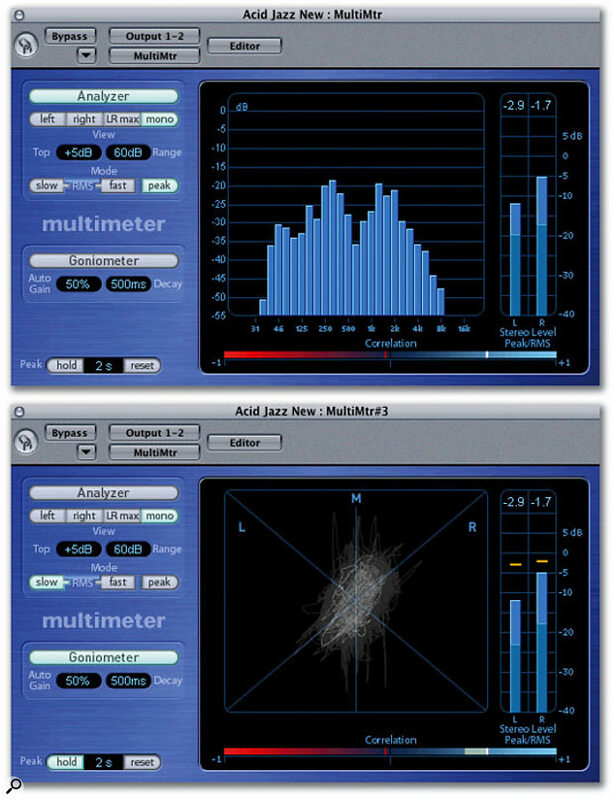 The other pane relates to Transients and provides a waveform display and beat ruler for dealing with rhythmic loops. This works a little like Propellerheads' Recycle in identifying transients by level, where the user can change the sensitivity of detection. Any missed transients can be added manually and 'false hits' can be removed from the list before the file is saved. As I understand it, the process doesn't actually slice the file into beats, but rather adds the data to its metadata list, which tells Logic or Garage Band how to deal with the file when its length is changed. This avoids the doubling of transients that can occur with some simpler time-stretch algorithms and is one of the reasons Apple Loops retain such good quality when being sped up, slowed down or changed in pitch. Anyhow, it seemed easy enough to use and I got some great results without having to do any manual tweaking. After I turned some of my existing rhythm parts into Apple Loops, they could be stretched or compressed by 25 to 30 percent without sounding unduly processed. A good selection of Apple Loops is included, and working with them is joyously simple via the included Loops Browser. Loops can be auditioned and then dragged directly into a song, at which point their tempo and key will be made to match automatically. I know that serious musicians tend to frown on this kind of 'identikit' approach to music making, but it does provide a simple means of sketching out songs, even if you replace all the parts later. Apple Loops can be transposed from within the new Global Tracks Transpose section using a graphical approach similar to existing automation editing, and Arrange object loops may now be created Garage Band-style by dragging from the upper end of an original Audio object to the desired location. The old Logic looping mode still works too, but the advantage of this new method is that you can stop the loop at any point without having to place an Arrange object in the track to act as an end-stop. Apple Loops and MIDI parts will follow transpose changes in the Global Tracks, but conventionally recorded or imported audio won't be affected unless first converted to the Apple Loops format. Other than the addition of numerous new plug-ins, the Arrange page is where most visual changes to Logic Pro have taken place. Editing is still not sample-accurate in the Arrange window, but the editing system now includes new edit modes that will be more familiar to Pro Tools users. The new modes are Shuffle, Snap and Crossfade, and are accessed by two small edit behaviour menus (Snap and Drag) at the top right of the Arrange window. Shuffle joins regions without gaps or overlaps in a similar way to Pro Tools, but also offers separate Shuffle Left and Right modes so that either the object before or the one after the one being worked on does the moving. 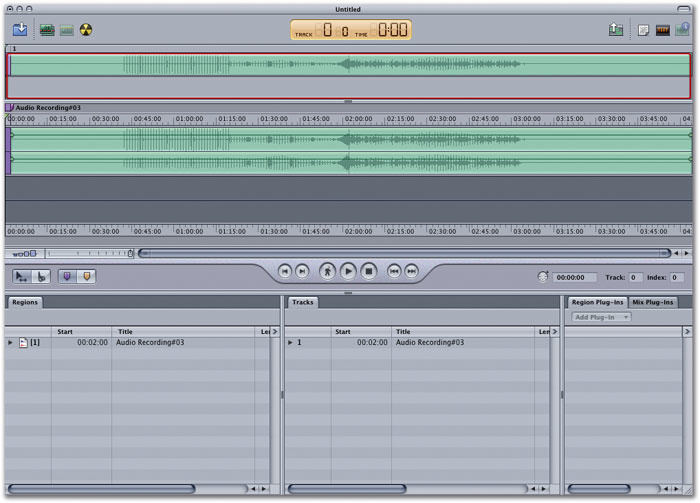 The Snap menu provides the option to snap regions to a user-definable time grid or to use an intelligent Auto Snap mode based on the current screen resolution, and Crossfade creates an automatic crossfade when two audio regions are overlapped by dragging one over the other. These new modes are very useful when using Logic for complex editing, and of course the track grouping facility introduced a few incarnations ago means that you can edit multiple tracks at the same time without losing sync between them. However, when using groups I'd like to see a more flexible Glue tool bounce dialogue that provides the choice of mixing all the regions in the group to new and separate tracks. Sometimes you just want to make edits permanent without combining the tracks as well, and currently you have to ungroup the parts before you can glue them up separately. Still on the Arrange page, we have new Zoom sliders that can be dragged or clicked to change the horizontal and vertical zoom resolutions and there's also a 'crosshair' section in the horizontal zoom toolbar that can be used for scrolling both horizontally and vertically at the same time. Three zoom resolutions can be memorised and recalled via keys, but having the vertical and horizontal sliders at diametrically opposite corners of the Arrange window seems somewhat less ergonomic than it could be. Having worked with these for a while now, I still prefer the old 'telescopes'. You can still use key commands for zooming, though, if you prefer that way of working, and my Logic Control units functioned normally with Logic Pro 7, so you can also zoom from there if you have one. Double-clicking on an Audio object within the Arrange window now opens the Track Mixer rather than the Audio Environment, and it seems to be Apple's intention to wean us away from using the Audio Environment for routine mixing work. In most respects the Track Mixer is extremely good, with view choices that let you see only the type of tracks you want to see, but by only being able to show what's in the Arrange window, it falls down in not allowing you to see busses and masters unless they already exist on the Arrange page — where you may not really need them to be. If you are to insert master processing plug-ins or buss effects, you need to be able to get at these from within the Track Mixer without littering your Arrange window with things you don't really want to see. My current workaround is to put all these at the bottom of the Arrange page and then slim their tracks view as much as possible to save space (or hide them), but I feel it would be far better to be able to access them from within the Track Mixer without having to do this. Conversely, a way to access the master level control and meters from the Arrange page would also be useful. Though the cosmetics of the Track Mixer and Audio Environment seem to have take on an overly grey persona, there are some significant improvements here too, not least of which is that the selected Audio object is now shaded a paler colour to make it very easy to spot. You can also now save and load channel strip settings, complete with effects, from within the Track Mixer or the Arrange window Channel Strip. Of course this opens up a whole new world for the preset creators, and already there's a library of hundreds of channel strip settings for those users too shy to create their own settings from scratch. The ability to save your own processing setups is very welcome, even though you may have to make material-specific tweaks to the plug-in settings once you've called them up. Another time-saver is the improved ability to select multiple Audio Environment objects and then edit their routing simultaneously. This also works in the Track Mixer. You could do this with earlier versions, but then you had to remember which function keys to hold down! This works for both input and output sources and for the sends, which really does save on a lot of tedium, but it doesn't allow multiple tracks to be grouped simultaneously — you still need to do that on a track-by-track basis. One gripe that I know a number of users have expressed has finally been addressed — plug-in windows can now have their link box ticked to make them change to whatever plug-in is being used in the selected sequencer track. This looks at the top plug-in slot where multiple plug-ins are being used and gets around the old problem where you would be looking at one track and inadvertently adjusting the plug-in belonging to another. Furthermore, open plug-in windows can now be saved as part of screensets. For the travelling composer who likes to write songs on the train or even on the beach using a laptop, pressing the Caps Lock key brings up a keyboard diagram showing which of the computer keys now function as keys for playing MIDI instruments. Other keys allow the octave and velocity to be changed and, best of all, it works polyphonically so you can enter chords from your computer keyboard simply by pressing down the requisite key combination. The key layout mirrors that of a conventional keyboard, though some key stickers might make it more usable. Composer David Lowe, who dropped around to see Logic Pro 7 in action, picked this as the one feature that would be of most use to him, as he spends such a lot of time working on trains and planes. Last month I reported that most of my Waves, Korg, Spectrasonics, Yamaha, Native Instruments and Powercore plug-ins crashed Apple's AU checker or failed some aspect of the test. Since then, Korg's Legacy Collection has been updated and is accepted without fuss, as has the Powercore collection. At the time of writing, two of the three Spectrasonics instruments had been tweaked, with the third following close behind, and Waves, Native Instruments and Yamaha were already on the case when I called them. Hopefully the integral testing routine will improve the stability of the system by warning the user against using any plug-ins that might rock the boat. For power users, the most welcome news is that Logic can now make use of multiple computers to share the processing load, though its approach is very different to that employed by Steinberg who were, as with so many things, first off the starting block in this area. No additional audio cards, copies of Logic Pro or dongles are needed for the additional computers, just a small piece of software called Logic Node that come with the Logic Pro install discs. This system is based on a conventional network using high-speed (Giga) Ethernet and the TCP protocol, where the additional computers are known as nodes. The users sets up the network connection between host and node in the usual way. The documentation suggests that connection over Firewire is also a possibility, but when I asked about this, I was told that Giga Ethernet is the best choice, as Firewire bandwidth is lower than that of Gigabit Ethernet, and in a typical music system, the Firewire buss may already be in use servicing audio interfaces, hard drives and so on, so the bandwidth left for networking would be restricted. Where multiple node computers are connected, the network switcher must also be able support Gigabit bandwidth, and Logic Node requires OS 10.3 or later. The documentation specifies the node machines as either single or dual-processor G5s, with the host machine being either a G4 with Giga Ethernet or a G5. In use, you run tracks you're currently working on on the master machine to avoid latency problems. Once completed, they can be switched from the host processor to node processing using a Track Node button, whereupon everything runs in perfect sync. The Track Node buttons can be brought into view via the View menu and have three states: disabled, enabled but inactive or enabled and active. I don't have two Giga Ethernet-compatible machines of my own, but the Emagic engineers set up a working demonstration for me using a G4 Powerbook as the master machine and a G5 as the node. It worked perfectly, with the CPU meter on the laptop hardly flickering, even though the song contained a lot of heavy-duty plug-ins. I didn't have a chance to see the system working with multiple nodes, but in theory this should be no more problematic. 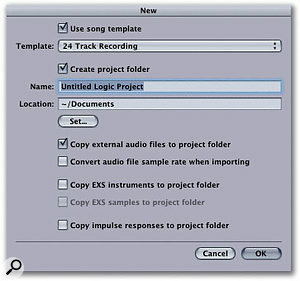 Where multiple node machines are in use, Logic automatically shares the load between them for any node-enabled tracks. Audio and virtual instrument tracks can be assigned to nodes, but busses, outputs and aux channels can't, so your host machine needs to be powerful enough to handle 'send' effects such as reverb. Furthermore, EXS24 instruments are also restricted to the host machine, to avoid shunting samples around over the network. This means the sample library needs to be located on a drive connected to the host computer, not one of the nodes. When Logic Node is being used, any firewall software should be disabled, and the network shouldn't be used for any other purpose as this will eat into the available bandwidth. Where a G5 is being used purely as a node machine, Logic Node can be placed in the Startup Items, enabling the machine to be run without keyboard, monitor or mouse, though some users may wish to use Apple Remote Desktop to access the node machines from their main machine. The ability to import Garage Band songs may not seem important to those who regard Garage Band as a bit of a toy, but the reality is that many Logic users already use it as a way to work on songs while on the move. When a Garage Band song is imported, Logic tracks are created to match the Garage Band tracks and effects are provided via busses 1 and 2, which are set up with Platinumverb and Tape Delay by default. To provide full compatibility, Logic Pro 7 includes all the Garage Band software instrument plug-ins, and you shouldn't dismiss these as poor relations, because many seem to be based on the same high-power synthesis engines as existing Logic plug-ins but with a far simpler user interface. Unlike the pictorial splendour of the main Logic Instruments, these are simple, no-nonsense silver panels with a handful of horizontal sliders and the occasional button. For example, the tonewheel organ sounds much like EVB3, but instead of individual drawbars, there's a single slider that moves through multiple drawbar combinations, making it very easy to find a combination you like. The percussion and rotary speaker sounds have also been simplified, as has the distortion, but the final audio result is every bit as good as EVB3. In fact I found it easier to get the sound I wanted from this plug-in than from EVB3 itself. Of course, being based on the same engine as EVB3, the processor load is also similar. The only down side is that this plug-in seems to use different rotary speed controllers to EVB3, so they are not directly interchangeable within a song. In all there are 20 Garage Band instruments, most of which are dedicated to a particular sound type such as piano, electric piano, Clavinet, guitar, horns, voice, organ, tuned percussion, bass and so on. There are also five simple 'analogue' synths for producing pad, bass and ensemble sounds, as well as a rather intriguing plug-in called Digital Stepper, which is an additive synthesis instrument capable of producing a wide range of organ and digital pad-like sounds along with sample-and-hold-style modulation. It may be simple but it's a real gem and I'd like to see a more comprehensive version made available as a main Logic instrument. Also worthy of note is the simple Drums instrument, which offers a choice of really good-sounding drum kits, mapped and ready to play. The only obvious limitation is that you can't change the balance of the sounds within each kit, other than by editing your MIDI velocities after playing. Another feature that hasn't materialised, despite numerous requests, is a way to bounce audio instrument tracks or processed audio tracks 'in place', though there is a new Bounce folder in the Project folder to which single or multiple tracks can be bounced (single files are bounced by soloing them). This saves the bounced files as Broadcast Wave Files and is particularly useful for turning virtual instrument tracks into audio, as well as for mixing whole songs. Once bounced, it's fairly easy to drag the file or files back into the Arrange page, but a proper bounce-in-place mode would still be much easier to use and it would be a lot faster, so it stays on my wish-list. On the plus side, my wish to be able to start new songs as new Projects has been realised, so when New is selected, you are greeted with a dialogue box that asks you whether you want to create a new Project, what you'd like to put into the Project folder and what Template you'd like to use as a starting point. As explained last month, Templates are like having different default songs for different jobs, but you can call them up directly when starting a new Project. A related 'behind the scenes' aspect of the program is to do with where the files are installed. Previously, there was a Logic folder and all the support files went in there along with it. 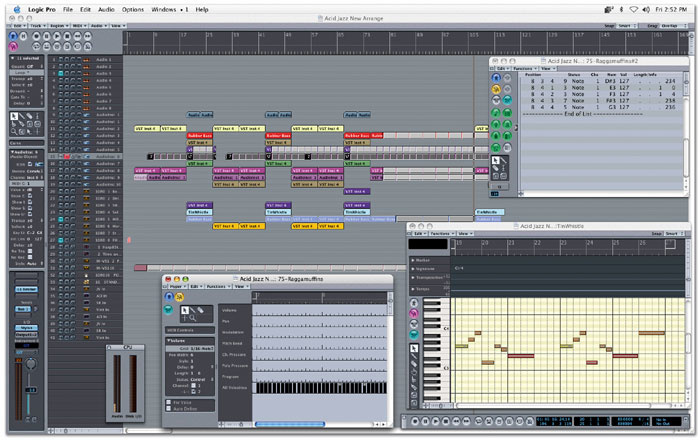 The new installation puts things like the sampler instruments and plug-ins settings folders into Applications Support within the Library, but if you already have existing Logic 6 files, they'll still be found if you leave them where they are. Logic Pro 7 looks for files in the following directories in the order of: Library / Application Support / Logic, Library / Application Support / Logic and Applications / Logic 6 Series. New user plug-in settings are stored in User Application Support. If you're planning to scrap Logic Pro 6 after updating to Pro 7, then it would probably make sense to move all the necessary files to the correct Pro 7 locations and delete any duplicated samples and so forth. 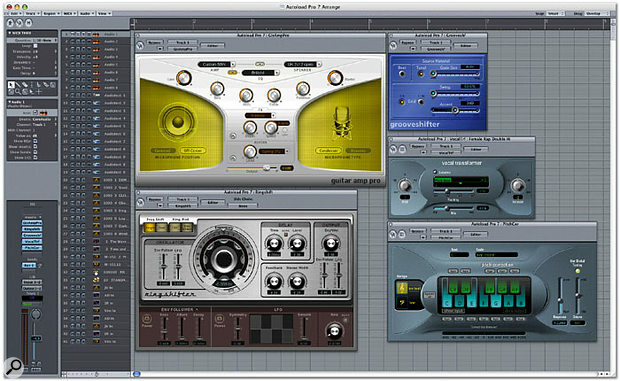 The plug-in section has been augmented by new Logic instruments, processors and meters, plus all Garage Band 's instruments. Previewed at the Winter NAMM show earlier this year, Sculpture is probably the most powerful software instrument from the Logic stable and uses physical modelling to emulate the vibrational modes of strings and rods. Settings may be morphed and the virtual materials from which the virtual strings are made can be changed or blended. Sculpture is pretty complicated, but fortunately it comes with a vast array of categorised presets to get you started, and you can always dip a toe in the water by tweaking these to see what happens or by using the Random button, where the degree of randomisation is user adjustable. The virtual strings can be virtually bowed, picked, struck or blown as well as being damped or disturbed, but most of the results are obviously synthetic and are reminiscent of earlier wind modelling synths combined with granular synthesis and extreme filtering. There's a lot of fun to be had here, regardless of what musical genre you work in, but be prepared to put in a few hours of learning if you want to get the best out of this fascinating instrument. Also, the way numerous controllers are grouped around a circle means there are many more controls than there might first appear, and as the writing is so small, seeing exactly what is what can be hard work. 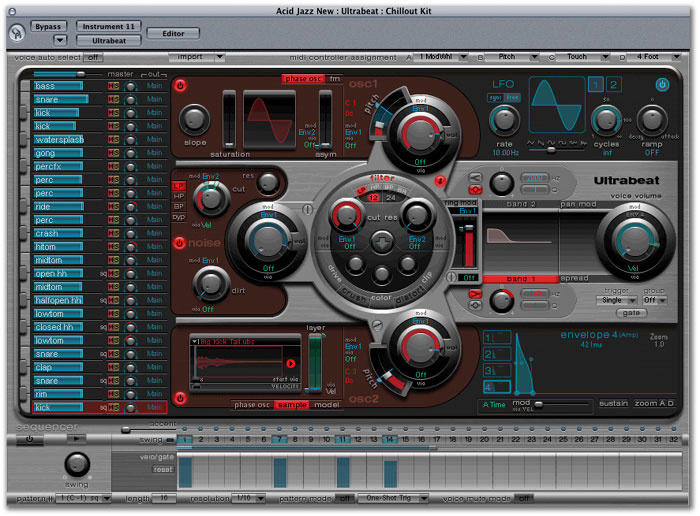 The Sculpture physical modelling synth is one of several major new instruments in Logic 7. The same comments apply to Ultrabeat (below) which was also premiered at Winter NAMM. It's a drum-sound generator which combines analogue-style subtractive synthesis with FM, sample playback and component modelling. There's also a phase oscillator, which uses phase distortion in a similar way to Casio's CZ synths to create changing harmonics, as well as more conventional forms of distortion. You can also import your own samples, so the sounds it can produce range from conventional sample-based drum kits, through TR-style electronic sounds, and right out the other side to industrial mayhem. Each voice can be made up of two oscillators, a noise generator and a ring modulator, where the oscillators can be sample- or synthesis-based. Up to 24 different voices can be generated simultaneously and there's also a simple beatbox-style internal step sequencer that can be triggered from within Logic, using MIDI notes to switch patterns. This sequencer has up to 32 steps and can store up to 24 patterns. In addition to the drum sounds, there's also a 25th polysynth voice that works off the remaining three octaves of the keyboard. Having had the chance to play with this for a while, it's very comprehensive, and like Sculpture, you need to work with it for a while to get a feel for what you are doing. 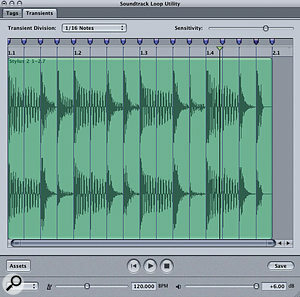 Logic 's save and load routine saves complete Ultrabeat setups, not individual drum sounds, though it is possible to copy and paste individual drum sounds from one kit to another using the clipboard after first selecting and copying a sound by Control-clicking on the sound name to open the copy menu. Ultrabeat also has eight separate outputs, and most parameters can be modulated via LFOs or envelopes to create dynamic effects. I enjoyed the range of sounds that could be achieved from this instrument, and the import options make it fairly easy to recombine voices into custom kits. The EFM1 FM synth is fairly simple by contrast, and sits alongside Logic 's original 'basic' instruments. It offers up to 16 voices of polyphony and is based around a single multi-wave carrier oscillator and a sine wave modulator. Structurally, then, this is far simpler than multi-operator FM synths, but because the carrier oscillator can produce various waveforms, and because the depth and frequency of modulation can itself be modulated, the range of sounds that can be produced is wider than you might expect. It's certainly possible to generate a lot of bell and fast-attack bass sounds, though as you'd expect, the flexibility of this little synth falls far short of something like Native Instruments' FM7. As well as the instruments themselves, there's also an External Instrument plug-in that allows MIDI from an instrument track to be routed to an external sound module via Logic 's MIDI Environment. 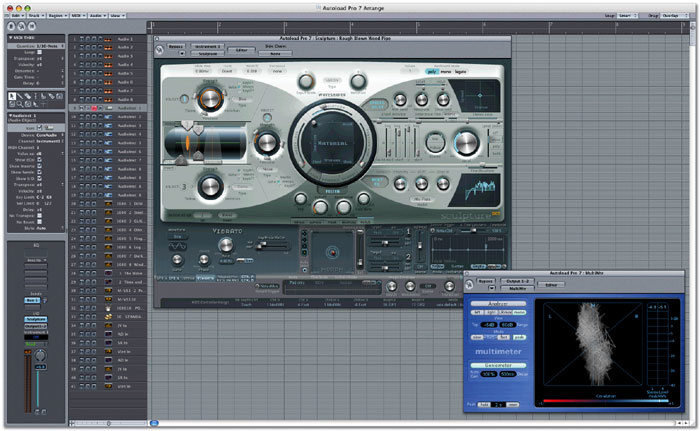 In essence, the plug-in is designed to allow externally connected MIDI synths to be accessed in a way that's more similar to the way software instruments are accessed. The EXS24 sampler has also been updated to allow the drag-and-drop placement of samples in the Edit page. Dragging an audio file onto the Edit page keyboard creates a new zone, where the upper and lower limits of the zone are initially set to the key that the file was dropped on. Whereas before you had to change the zone boundaries by changing numbers in dialogue boxes, you can now simply drag them to the required position. Furthermore, the Extreme Analogue and Extreme Digital sample libraries join the other factory samples, so there's a huge range of really high-quality sounds on tap as soon as you boot up Logic Pro for the first time. Your existing sample library is shown in the list as a separate entry unless you move it into the new Logic Pro 7 location. With the addition of all Garage Band 's instruments (see box) and the existing ES1 and ES2, Logic 's roster of software instruments is second to none, and the simple drag-and-drop additions made to the original EXS24 are very welcome. The flashy instruments may attract most of the attention, but the range of processing plug-ins has now been extended to the point that there's little you could want from third-party plug-ins. The biggie is probably Guitar Amp Pro, which models different guitar amplifers, amp EQ sections and speakers as well as giving you a choice of mic types and on or off-axis positioning. Existing recordings or synth sounds can also be treated via this plug-in, so it isn't limited to guitars. Though there are fewer adjustable parameters than on some guitar modelling products, and there are no integral effects other than tremolo/vibrato and a choice of three 'spring' reverbs, Guitar Amp Pro can be used in line with other Logic effects (it sounds pretty cool fed into EVB3 's rotary speaker effect, for instance) and its basic sound quality is extremely good. The overdrive effects cut through well without getting too gritty. Of the new processing plug-ins, Guitar Amp Pro is the biggest news, but there are some other very useful tools such as Pitch Corrector, Grooveshifter, Vocal Transformer and Ringshifter. Grooveshifter appears to be a last-minute addition as I couldn't find it in the manual, and seems to be designed to add swing or groove to audio parts by using granular synthesis methods. The processed result can be made to sounds reasonably natural or deliberately 'granulised', depending on how much change you apply to the original file. Ringshifter is also just as destructive as I expected it to be, as is the new Vocal Transformer, while my tests on Pitch Corrector so far have been very successful — it works well on monophonic instruments as well as voices. A low setting is available for tracking bass frequencies, and the pitch reference can be adjusted at the plug-in or set in the song settings, in which case it also serves as a tuning reference for all the software instruments used in the song. Pitch Corrector 's piano keyboard display allows you to set up the notes in the scale you wish to use (and to exclude ones that shouldn't be fixed) if one of the standard scales doesn't fit, and though there are no weird ethnic scales using quarter-tones, it copes well with all conventional musical styles. The amount of pitch correction is shown on a horizontal meter where the centre corresponds to no correction. Parameters can also be automated, which may be useful in adjusting the correction speed throughout a song to get the most accurate sound while still being able to quickly knock the odd dodgy note into touch. It's also easy to bypass the plug-in when not needed using automation, allowing processing to be applied only to suspect notes or sections. However, only one user scale can be used per song unless saved into the settings file. Once saved, scales may also be automated throughout a song. And as I mentioned last month, if you like the creative abuse of these devices, Cher's 'Believe' vocal effect can be recreated very authentically just by setting the pitch correction rate as fast as possible. I shan't list describe every plug-in, but Match EQ is worthy of further exploration. This is what some people refer to as a fingerprint equaliser, and its aim in life is to make the audio spectrum of one sound file match that of another, reference file. It does this by analysing both files over a period of time, then creating a multi-band filter based on the inverse of the difference between them. This plug-in is available in mono and stereo versions, and audio 'template' or 'current file' material can be learned from within a track or by dragging the file onto the respective buttons in the plug-in. The plug-in's side-chain facilities can also be used to create templates. Where the two sounds being matched are already very close, it may be sufficient to let Match EQ work without intervention, but the user can affect the outcome both by controlling the amount of the computed EQ curve applied, and by graphically editing the curve via clicking and dragging. This can be useful where you want to match the high end of a mix but leave the bass end alone, for example. Match EQ is valuable for matching the characteristics of recordings made in different rooms or with different mics, but it also works on mixes providing they are in a similar style. Furthermore, because so many filter bands are employed, the accuracy of matching is far more detailed than can be achieved using normal equalisation, no matter how good your ears. I also mentioned the Multimeter plug-in last month, which can be switched between a spectrum analysis mode and a goniometer 'jellyfish' display that provides information about stereo width, balance and phase. These phase meters are very useful when mixing, and stand-alone devices of this kind tend to be very expensive. Emagic's Waveburner CD-writing and audio editing application is now included, although it no longer has the ability to record audio. Lastly, although it's not exactly a plug-in, Emagic's Waveburner CD-writing and audio editing application has also been included in Logic, though you have to record files in Logic as this incarnation of Waveburner doesn't have the ability to record. Its interface has been given a beneficial Apple makeover, with the waveform editing area at the top of the screen and file management at the bottom of the same window. As far as I can see, it works in essentially the same way as the stand-alone versions and so shouldn't require any relearning by existing users. As well as OMF, Logic Pro now also supports XML import and export for moving audio material between Logic and applications such as Final Cut Pro. 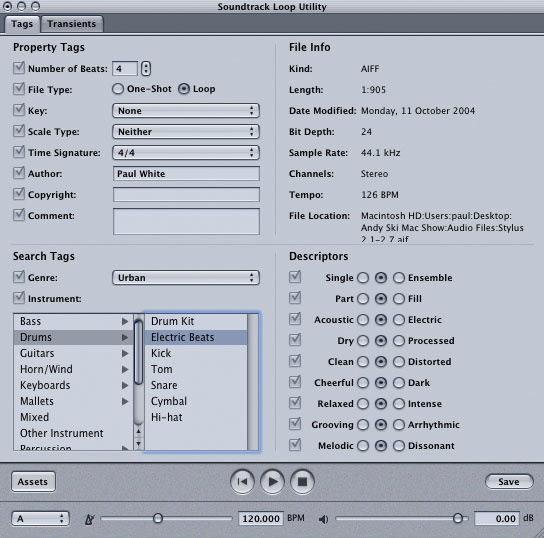 As touched upon last month, Quicktime movie soundtracks can also be imported or exported. Furthermore, AAC Audio (Advanced Audio Coding) multi-channel support is now included, as is the import and export of Open TL files, used mainly to swap files with Tascam's MX2424 hard disk recorder. In this latter format, only the audio files are transferred — MIDI and automation data is ignored. Music forums are already filling up with comments about Logic Pro 7, both praising it and otherwise. Most of those in the latter camp say they would prefer getting what's already there to work better, rather than being bombarded with 'bribe' features such as new instruments. In all fairness, there are still aspects of Logic that I feel need fixing, such as comprehensive plug-in delay compensation, in-place track bouncing, perhaps sample-accurate Arrange page editing and support for multiple audio interfaces, and many would argue that the visual side of the program is getting a bit gloomy and hard to read. There has also been concern about the number of incompatible third-party Audio Units plug-ins. However, most of the plug-ins that failed or crashed the AU validation test have already been updated or are in the process of being updated, and on my system, Logic certainly boots up a lot faster than before. Though this review has taken many hours, I'm sure that other operational issues will come to light only once I've used Logic 7 in anger for a longer period. However, I'm already feeling more at home with it and I know I'd miss some of its improvements if I had to go back to Pro 6. Furthermore, although there clearly are areas that could still be improved, Apple's software arm has a good reputation for producing well designed, stable products so you can bet that the team are already working on some of the issues I've brought up. On the whole, I feel that Logic Pro 7 offers a lot of genuine improvements, such as distributed processing and the new editing modes; Project management is also much improved, the Template feature is most welcome, and now I've had more chance to play with the new plug-ins, I have to say that the majority are very good indeed and definitely not added simply to make up the numbers. Integration with Garage Band not only allows Logic to import and play back Garage Band songs with all their original instruments, it also allows the full use of Apple Loops within Logic songs, and this format works so well that I can see a lot more third-party companies coming up with rhythm loop libraries in this format once they realise the potential demand. Having had time to get to know Logic Pro 7 better, I have to say that I'd have no hesitation in upgrading to it, and the cost involved is very modest when you consider what the extra plug-ins might cost if you were buying them from a third party company. And finally, though the Emagic name is no longer on the box, the people behind that name are still the people behind Logic Pro 7 and they're still very passionate about that they are doing, so if you have any constructive comments, you can still send them to us via Logic Notes and we'll pass them on to Apple on your behalf. Distributed processing possible across multiple G5 computers. New editing and bouncing modes. Supports Garage Band import and Apple Loops. Comes with a vastly expanded range of plug-ins, sample libraries and new Apple Loops library. Some visual aspects could be improved. No plug-in delay compensation in busses or outputs. No support for multiple audio interfaces . Logic Pro 7 includes many genuine improvements as well as a few frustrating omissions and just one or two steps backwards. On balance, though, it is a major update, and the superb new plug-ins alone make it worth the cost of the upgrade. Logic Pro 7 £699; Logic Express 7 £199; upgrade from Logic Pro 6, Logic Platinum and Logic Gold v5/6 £199; upgrade from Logic Express 6 or Logic Audio Big Box v5/6 to Logic Pro £499; upgrade from these to Logic Express 7 £69. Prices include VAT.